Is agency compensation trapped in a cost based model? At the ANA Advertising Financial Management Conference this year in Phoenix, Arizona, Dave Beals presented the latest findings from the ANA Agency Compensation Survey. 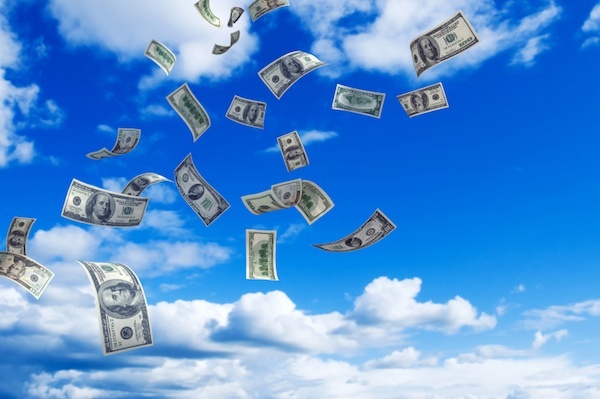 There are some really interesting findings here in regards to agency compensation. Now please excuse the use of the word “compensation” and not “remuneration” – this is the USA, so for consistency, I have used the reports nomenclature. The previous survey was in 2010 and so would have covered the period immediately preceding this being the end of 2009 and the start of the recession. In this survey, three years later, there are some definite trends. Thanks to the ANA I can share these trends with you. How much profit is fair profit? This is always a difficult question for procurement and marketing and often a point of contention in the negotiation with the agencies. After all, everyone will agree that it is important for the agency to make a fair profit. But when you ask what is a fair profit, the answers can vary wildly. I have had procurement leaders tell me “No supplier can make a profit margin higher than the company and that was 8% EBITDA”. Now this company had a turnover of $18 billion per year, But the agency in question was looking at $2 million in fees and 8% was about the return of a standard term deposit. But according to marketers (and their procurement leads) who completed the ANA survey, the answer is 14%. 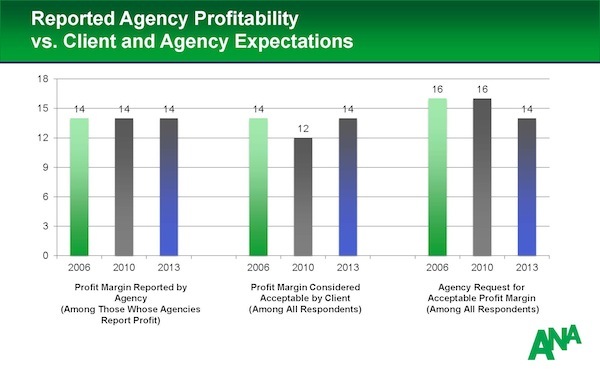 This is the profit margin reported by the agencies and requested by the agencies. 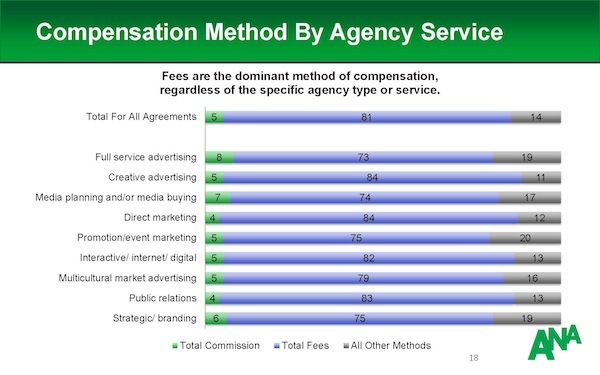 How are agencies being compensated? It appears that the trend has continued of commissions continuing to fall, albeit at a slower rate over the past ten years. In fact it seems like there has been a recent rally. Perhaps a last gasp before they disappear for good? Having said that, there are many on the agency side of the business that still reminisce for the good old days of full media commission. 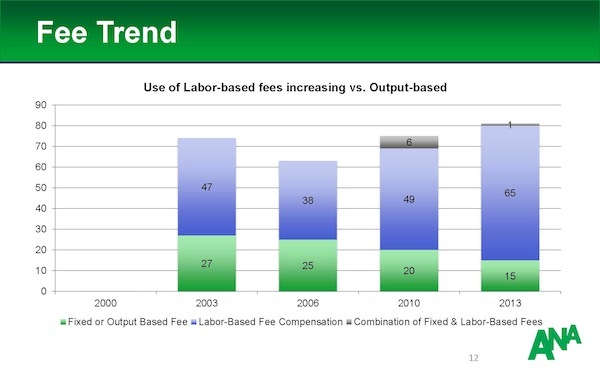 Likewise, total fees continue to climb in popularity. The resource based cost model is popular with agencies as it guarantees their cost recovery on their biggest expense – resources, including overhead and a profit margin on top. But within total fees, there are a number of ways of paying these, including retainers, hourly fees and fixed price project fees. Since Coca Cola Company began implementing their ‘value-based’ compensation in 2008, there has been high interest in the approach. Core to this approach is a fixed or output-based model as opposed to the input or labour-based model. In the past 10 years the incidence of fixed and output-based compensation has almost halved, with a corresponding increase in the variable cost or labour-based model. Output-based and fixed price models can be difficult to implement. Defining the outputs up-front, calculating and setting the price for the agency puts the onus on the marketer to define the value of the work. The alternative puts the onus on the agency to tell the marketer the price once they have delivered the work or the outputs. The problem is the process encourages inefficiency, and the lack of specificity means it is difficult, if not impossible, to identify this inefficiency. The number of hours to deliver any output can quickly expand to consume the available budget and soon that level of cost becomes the expected or standard cost. The alternative is that the marketer sets the price to be paid for a specific output and that the agency works to deliver the required output quality against the desired time frame. In this way the price defines the level of investment. With the current method the output and resources required determine the cost. During a time of fiscal restraint, it seems that convenience has overtaken the need for greater efficiency. But in cases where marketers have moved to output-based compensation models, they achieve an alignment between their agencies to their strategic requirements while staying with the labour-based model, they continue to simply hire resources at a cost. 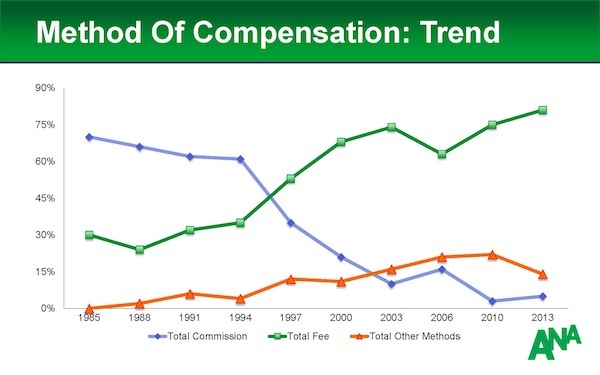 The trend toward fees and away from commissions and other compensation models appears consistent across all disciplines, with 70% – 80% of the compensation fee based, less than 8% commission and the balance ‘Other’. The fact that commissions are reported for Public Relations, Promotion / Event Marketing and Direct Marketing indicates that agency mark-ups of third party costs (usually charged as a commission or handling fee) are still common. While it is easier to simply pay for the hours the agency uses, there is no way of knowing if this represents value without benchmarking the cost after the event, when it is too late. The alternative is to set the price for the agency to deliver the output. This price is set based the strategic importance, the total level of investment, the potential or expected ROI, etc. It then allows the agency to work within the framework of the value rather than simply charging the cost. Getting this right can be tricky, which is why many have defaulted to the fee or labour-based model. 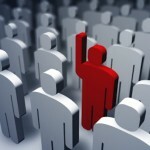 Has this stopped you developing your own value-based compensation model? What have you found to be the key barriers? Let me know by leaving your comments and suggestions here. We have developed these models for many different marketers and are happy to share our insights to help you overcome these issues.